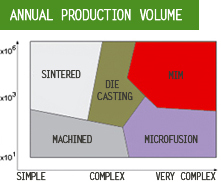 As can be seen on the graph, MIM is an unrivalled technology for the production of large volumes of small parts with high levels of geometric complexity and mechanical performance. MIM is a novel manufacturing technology that allows highly complex parts to be obtained completely reliably and precisely, with mechanical properties similar to those of any machined, microfused or laminated materials. 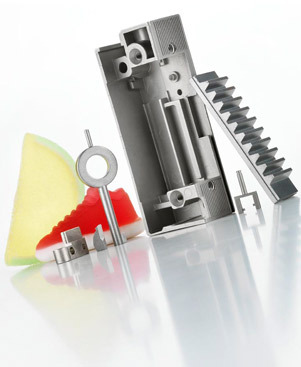 The Metal Injection Moulding production process combines the advantages of sinter processes with the flexibility of processes that use thermoplastic injection. It provides a vastly superior quality than either process and achieves densities that can be as high as 99%. When can MIM technology be used? Wall thickness 3-9 mm. 25 mm. 0,3 mm. Min. dimension - - 0,2 mm. Weight 5-20 gr. 120 gr. 0,05 gr. Bore diameter 5-10 - 0,2 mm. Radii 0,3 mm. - 0,1 mm. MIM offers an economical solution for obtaining complex shapes. It gives almost unlimited design freedom. It provides highly precise dimensions, thus eliminating the need for machining operations. Where other technologies require assemblies, welds and joining components, MIM allows complex shapes to be achieved in a single process. Surface quality of up to a high quality of Ra 0.8 can be obtained directly from the process. It can be used to produce internal and external threads. The MIM process is highly ecological and environmentally friendly, as it doesn´t create any waste or atmospheric emissions. It is a safe and friendly process.